Find your beat at Stockton, California's best live music spots! Tired of the same old dinner-and-a-movie routine? If you live in Stockton, or are planning a trip to the waterfront city in San Joaquin County, then mark your calendar because you’re going to see a show. That’s right. Stockton’s nightlife scene is thriving, and offers an expansive list of live music alternatives to just “going out.” With plenty of cool venues and all the music genres to choose from, we assure you that you’ll find a beat that fits. Here’s a list of Stockton, California's best live music venues to help spice up those monotone evenings. Located in downtown Stockton, this performance palace is a community landmark and listed on the National Register of Historic Places. But it is much more than just your ordinary performance theater. Built in 1930, the theater drew 20,000 people to opening night, including many famous stars. In 2004, it enjoyed an expensive restoration, highlighting many of the beautiful interior details, including Italian marble mosaic flooring and several decorative murals. The ornate interior now includes more than 2,000 seats and makes for excellent acoustics. Throughout the year, guests of the Bob Hope Theatre can explore several artistic genres—not just live music and dance, but also the visual arts. Big- and small-name acts will grace the stage in 2017. For a memorable and comfortable seated live musical performance, don’t miss live music at this incredibly beautiful staple of Stockton. 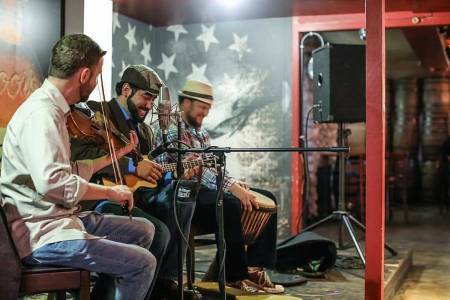 Downtown Stockton's Cast Iron Trading offers live music Friday and Saturday evenings. With a rotating craft beer selection and wine, featuring local Stockton beers, nearby regional favorites and other selections from around the state. If you're hungry, pub-inspired dishes include braised pulled pork sliders, mini grilled-four-cheese sliders, and the oh-so-delicious, tachos, among others. Good music and great beer have always gone hand in hand, and not only does this brewery produce its beer, they also treat their brew enthusiasts to live music. Located in downtown Stockton, this taproom holds lively music events every Friday and Saturday nights, along with unique monthly music events and open mic nights. Be sure to pair the good night with a gourmet pizza and a couple of rounds of Jenga. What better way to spend a summer evening with family and friends than by listening to live music - especially outdoors!? For more than 65 years, Concerts in the Park at Victory Park has filled the air with gentle tunes and the sound of laughter. Free concerts occur June through August, each Wednesday from 6-8pm. Just be sure to arrive at the park early to find close parking, ample shade, and a good viewing spot! Live music is a great way to add ambiance to a special event or outing. At Mile Wine Company, nestled in Stockton’s Miracle Mile shopping district, you’ll feel right at home during weekly live musical performances, especially with a glass of handcrafted wine straight from the company’s curated wine cellar. At this wine bar, you will discover the sounds of local/regional talent in styles ranging from R&B and soul to classical jazz and the blues. Order some house-marinated olives or a charcuterie board and enjoy a glass or two while contemplating the sounds of your sophisticated night out in Stockton. This is the best place to see free live music in Stockton between April and September. Stockton’s favorite outdoor oddity, Stockmarket, now at the Stockton Marina offers good music in tow. This is a great way to celebrate fabulous weather while shopping, eating and drinking through dozens of curated vendors. Additionally, Stockmarket is beefing up its musical repertoire and showcasing even more musical talent. Enjoy alternative bands and DJs while noshing on your favorite foods from nearby gourmet food trucks. Grab a shady spot and spread a blanket out in the grass. Live music is free to enjoy and casts a cool vibe over the crowd of artists and shoppers. Not another microbrewery/family-friendly-style restaurant! Actually, it’s a sports bar and jazz club, too. And if we’re being totally honest, Valley Brewing Company is all those things and more. If you’re the “beer drinker with a hankering for live music you can enjoy in flip-flops” type, head over to Valley Brewing Company on the Miracle Mile. You’ll find all the ingredients for a good time: sports on big TVs, an amazing selection of California craft beer, a breezy patio and delicious food. But what really sets this place apart from other brewhouses is the Take 5 Jazz Club, hosting an eclectic mix of musical performances from local artists you won’t want to miss. From piano soloists to horn ensembles, there’s a great range of talent to choose from throughout the week. Admission is $10 at the door and may vary by season. For a unique Stockton experience, you simply have to head toward the water. Garlic Brothers Restaurant & Bar is located on the delta, which means seafaring guests get a spot to tie their boat off at the restaurant’s dock. Every Thursday, Garlic Brothers delivers a weekly late-night jam session at about 8pm, and during warmer months, live bands on Friday and Saturday evenings. And with no cover for patrons, this is a great way to enjoy some seriously good eats at a price everyone can afford. Seating is done on a first-come, first-served basis, so plan ahead and make it a meal. The house gumbo is a local favorite and the perfect plate to accompany this night out on the famous Stockton Delta. If you think you’ve got the guts to get onstage and sing with the band, you better head to the Miracle Mile shopping district first for a few rounds of karaoke at Whirlow’s Tossed and Grilled. This casual, quick-service restaurant specializes in smoked ribs, pork and grilled chicken, as well as chargrilled tri-tip and roasted turkey. Trust us, you definitely won’t leave hungry, but you might leave a rock star. Every Tuesday night at 7 p.m. guests get to enjoy their favorite barbecued meats while listening to amateur talent hit the high notes. Whirlow’s also has live music every Thursday and Friday night performed by its very own house musicians. On Saturdays, touring artists join the scene for impromptu jam sessions of every variety. Check Whirlow’s full list of upcoming musical talent. If you’re a purist when it comes to your cocktails and music, nothing is simpler than whisky and the blues. Whisky Barrel Tavern is a fantastic local dive located in the Miracle Mile shopping district. Aside from stiff drinks and friendly service, guests will love the lively bar scene, curated whisky selection and, of course, live music performed by popular local bands. There’s even a shuffleboard table if you feel like making a friendly wager. The family-style picnic tables make it easy to meet new friends. But don’t get too comfortable; you may find yourself aching to get on your feet when the musicians take to the elevated stage. These live music venues are some of the best in Stockton, California. But there are plenty more where these came from. Check out the Stockton Night Life page for the latest buzz around town. Whatever your mood or music, Stockton’s got the beat any night of the week. Need more recommendations? Still have more questions? You can message us 7 days a week for assistance on shopping, dining, and things to do in Stockton.